M.Sc. and B.Sc. in Microelectronics and Semiconductor Physics Science at Novosibirsk State University, 2002. Ph.D. (Solid State Physics), RWTH, Aachen, Germany 2009.
present time, Post-doctoral researcher, University of Aveiro, Aveiro, Portugal. 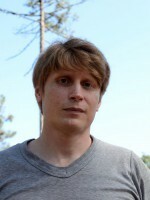 2009 – 2012, researcher at the Institute of Semiconductor Physics, Siberian Branch Academy of Science, Novosibirsk, Russia. 2005 - 2009, visiting researcher at IBN of Juelich research center, Juelich, Germany. 2002 – 2005,researcher at the Institute of Semiconductor Physics, Siberian Branch Academy of Science, Novosibirsk, Russia. 2000 - 2002 - Research assistance MBE Laboratory of Institute of Semiconductor Physics, Siberian Branch Academy of Science, Novosibirsk, Russia. Molecular Beam Epitaxy and Surfactant Mediated Epitaxy techniques. Development grants from the Russian Foundation for Basic Research (RFBR) ( Russia, 2001-2012), investigator. S. Y. Luchkin, K. Romanyuk, M. Ivanov, A. L. Kholkin, "Li transport in fresh and aged LiMn2O4 cothodes via electrochemical strain microscopy", Journal of Applied Physics, Vol. 118, 2015, p. 072016. G. Da Cunha Rodrigues, P. Zelenovskiy, K. Romanyuk, S. Luchkin, Y. Kopelevich, A. Kholkin, "Strong piezoelectricity in single-layer graphene deposited on SiO2 grating substrates", Nature Communications, Vol. 6, 2015, p. 7572. K. Romanyuk, S. Y. Luchkin, M. Ivanov, A. Kalinin, A. L. Kholkin, "Single and Multi- Frequency Detection of Surface Displacement via Scanning Probe Microscopy", Microscopy and Microanalysis, Vol. 21, 2015, p. 154-163. A. A. Shklyaev, K. N. Romanyuk, S. S. Kosolobov, "Surface morphology of Ge Layers epitaxially grown on bare and oxidized Si(001) and Si(111) substrates", Surface Science, Vol. 625, 2014, p. 50-56. S.A. Teys, K. N. Romanyuk, B. Z. Olshanetsky, "Structure of initial Ge nanoclusters at the edges of Si(111) steps with the front in the <-1-1 2> direction", Journal of Crystal Growth, Vol. 404, 2014, p. 39-43. K. N. Romanyuk, A. A. Shklyaev, B. Z. Olshanetsky, "Structure and stability of Ge clusters on Si(111) surface in the presence of Bi surfactant", Surface Science, Vol. 617, 2013, p. 68-72. V. A. Golyashov, K. A. Kokh, S. V. Makarenko, K. N. Romanyuk, I. P. Prosvirin, A. V. Kalinkin, O. E. Tereshchenko, A. S. Kozhukhov, D. V. Sheglov, S. V. Eremeev, S. D. Borisova, E. V. Chulkov, “Inertness and degradation of (0001) surface of Bi2Se3 topological insulator”, J. of Appl. Phys., Vol. 112, 2012, p. 113702. S. Korte, K. Romanyuk, B. Schnitzler, V. Cherepanov, B. Voigtlander, S. N. Filimonov, “Selective Adsorption of C60 on Ge/Si Nanostructures”, Physical Review Letters, Vol. 108, 2012, p. 116101. V.V. Atuchin, V.A. Golyashov, K.A. Kokh, I.V. Korolkov, A.S. Kozhukhov, V.N. Kruchinin, S.V. Makarenko, L.D. Pokrovsky, I.P. Prosvirin, K.N. Romanyuk, and O.E. Tereshchenko, “Formation of Iinert Bi2Se3(0001) Cleaved Surface”, Crystal Growth and Design, Vol. 11, 2011, p. 5507-5514. O.E. Tereshchenko, K.A. Kokh, V.V. Atuchin, K.N. Romanyuk, S.V. Makarenko, V.A. Golyashov, A.S. Kozhuhov, I.P. Prosvirin, A.A. Shklyaev, “Stability of (0001) surface of topological insulator Bi2Se3”, JETP Letters, Vol. 94, 2011, p. 500-503. A.A. Shklyaev, K.N. Romanyuk, A.V. Latyshev, and A.V. Arzhannikov, “Effect of Dislocations on the Shape of Islands during Silicon Growth on the Oxidized Si(111) Surface”, JETP Letters, Vol. 94, 2011, p. 442-445. K.N. Romanyuk, A.A. Shklyaev, B.Z. Olshanetsky, A.V. Latyshev, “Formation of Ge clusters at a Si(111)-Bi-root 3 x root 3 Surface”, JETP Letters, Vol. 93, 2011, p. 661-666. K. Romanyuk, V. Cherepanov, B. Voigtlander, “Symmetry and shape of Reconstructed Two-dimensional Islands”, Physical Review B, Vol. 83 (20), 2011, p. 205413. J. Brona, V. Cherepanov, K. Romanyuk, B. Voightlander, “Formation of pits during growth of Si/Ge nanostructures”, Surface Science, Vol. 604, 2010, p. 424-427. K. Romanyuk, J. Brona, and B. Voigtlander, “Namoscale Pit Formation at 2D Ge Layers on Si: Influence of Energy and Entropy”, Physical Review Letters, Vol. 103, 2009, p. 096101. R.A. Zhachuk, K.N. Romanyuk, S.A. Teys, B.Z. Olshanetsky, “Initial Stages of Germanium Growth on the Si(7710) Surface”, Physics of the Solid State, Vol. 51, Issue 1, Jan 2009, p. 202-207. M.V. Yakushev, D.V. Brunev, K.N. Romanyuk, et al., “Surface Morphology of a Si(310) Substrate Used for MBE of CdHgTe: I. Clean Si(310) Surface”, Journal of Surface Investigation-X-Ray Synchrotron and Neutron Techniques, Vol. 2, Issue 1, Feb 2008, p. 114-119. M.V. Yakushev, D.V. Brunev, K.N. Romanyuk, et al., “Surface Morphology of a Si(310) Substrate Used for MBE of CdHgTe: II. Si(310) Surface Annealed in As-4 Vapors”, Journal of Surface Investigation-X-Ray Synchrotron and Neutron Techniques, Vol. 2, Issue 3, Jun 2008, p. 433-439. Physical Review B, Vol. 75 (24), 2007, p. 241309. K. Romanyuk, V. Cherepanov, B. Voigtlander, “Symmetry Breaking in the Growth of Two-Dimensional Islands on Si(111)”, Physical Review Letters, Vol. 99, 2007, p. 126103. 2017, ACS APPLIED MATERIALS & INTERFACES, 9, 23, 20029-20037. 2016, JOURNAL OF SOLID STATE CHEMISTRY, 236, 203-208. 2016, FERROELECTRICS, 496, 1, 20-27. 2016, LANGMUIR, 32, 21, 5267-5276. 2015, MICROSCOPY AND MICROANALYSIS, 21, 1, 154-163.